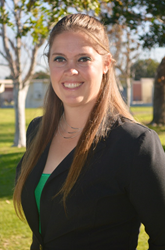 Holli Jackson MS, ATC, LMT, athletic trainer at Edison High School, is the District 8 Gatorade Secondary School Athletic Trainer of the Year Award. “I am honored to receive this award and represent all of the Secondary School ATC’s who work countless hours while impacting our young athletes lives." Holli Jackson MS, ATC, LMT, athletic trainer at Edison High School, is the District 8 Gatorade Secondary School Athletic Trainer of the Year Award. As part of the award, Holli received a grant for her program, as well as different Gatorade products from the performance package, a sideline cart, and an all-expense paid trip for the 2018 NATA Clinical Symposia & AT Expo. Jackson has been at Edison High School for 8 years and is responsible for the care and treatment of over 1,000 student-athletes. You can find more information on the Gatorade Secondary School Athletic Trainer Award here.